When in Southern California, locals and visitors can sail over to Catalina Island in one hour on a modern Catalina Express boat. Upgrade your ticket to the Commodore Lounge for special privileges that include early boarding, larger seats, a complimentary drink and snack. 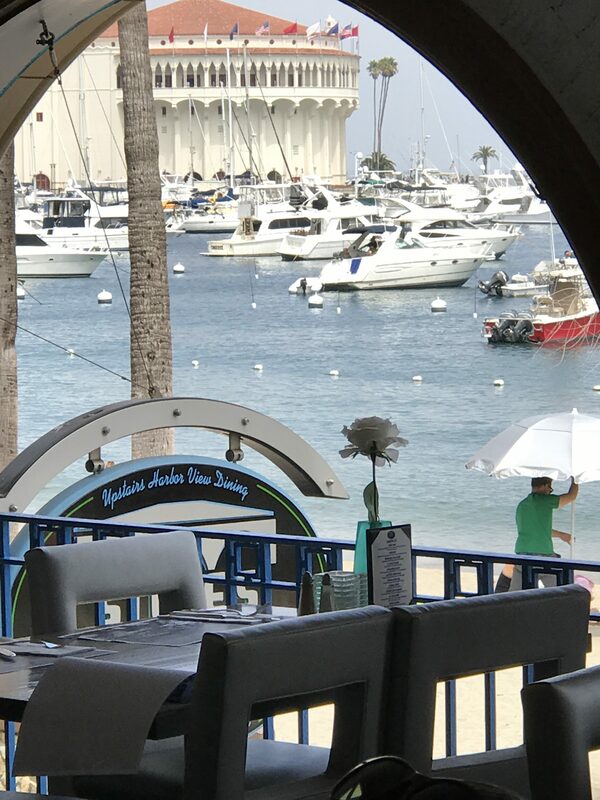 Once you arrive at the island take a stroll through the Mediterranean-looking town of Avalon to savor the flavors of six restaurants. 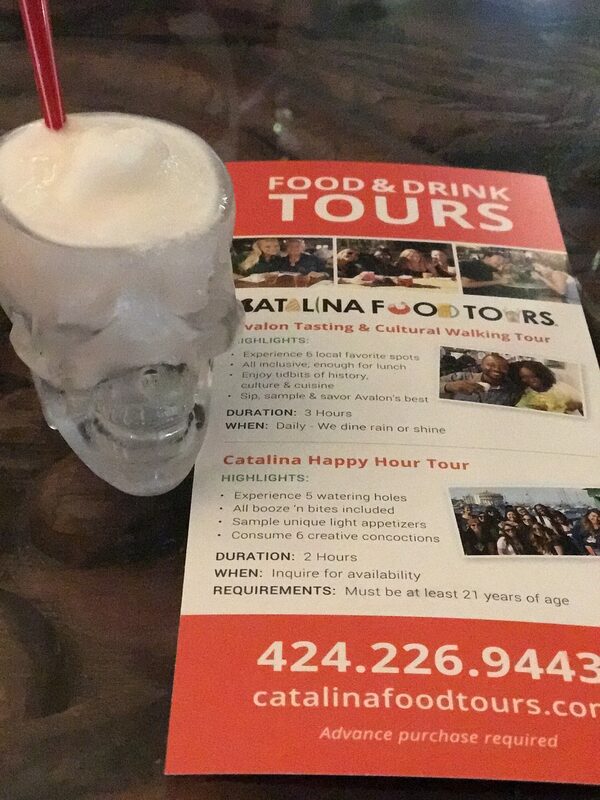 The Catalina Food Tour is a three-hour culinary experience that offers enlightening cultural, architectural and historical insight about the island, while offering tastes of a variety of flavors by the bay. We met our tour guide Paula from Catalina Food Tours on Crescent Avenue at noon. After introducing herself and telling us a little bit about the tour, she gave us an Avalon Tasting & Cultural Walking Tour booklet. The four pages included a tour map, some fun cultural insights and exclusive guest coupons to use while on the island. We followed her to our first tasting plate at Steve’s Steakhouse & Seafood. 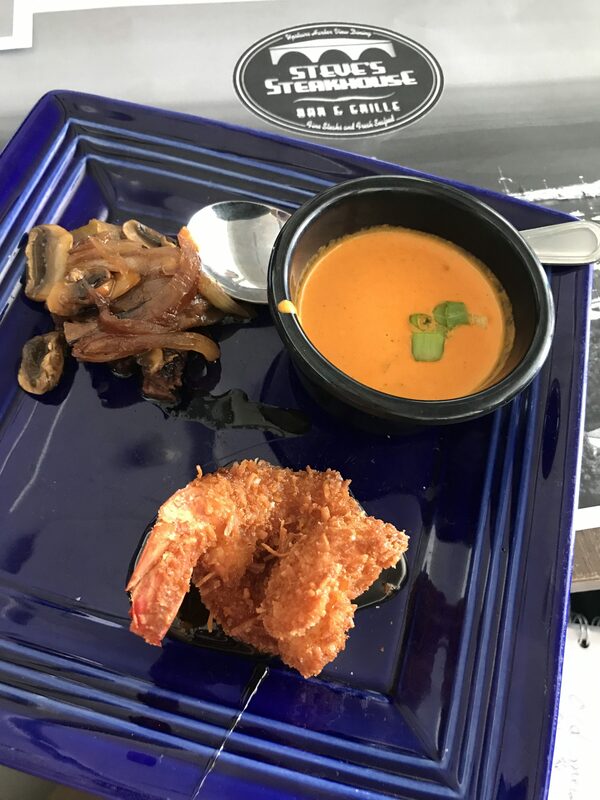 Walking up the stairs, we sat at a table set for eight people and sipped a glass of lemonade before servers brought out a plate with Teriyaki hibachi grilled skirt steak, one coconut-crusted shrimp and a small cup of tomato curry soup with small pasta shells. 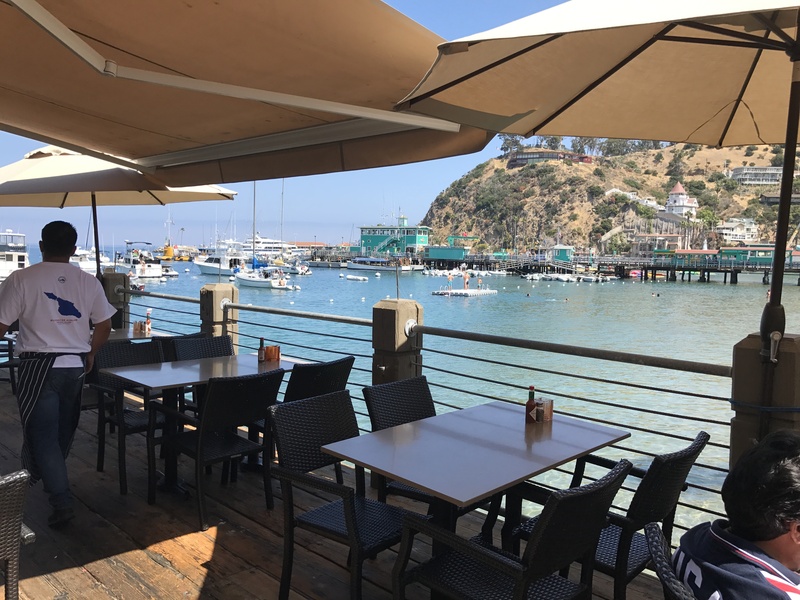 The owner of the restaurant, Steve Bray, is a fourth generation islander and his restaurant offers some of the best views of Avalon Harbor and the Catalina Casino. It’s known on the island as a special event restaurant for fine dining. We learned that the Catalina Casino is not a gambling venue, but home to the largest floating ballroom dance pavilion in the world. When the Big Bands performed live in the 1930s and ’40s, the dance floor held the world’s record of 6,200 dancers. It also houses the island’s movie theaer, known as the largest silent and talking movie theater in the West, with painted murals on the sides of the walls and twinkle lights on the ceiling. Paula told us that when the cruise ships are visiting the island on Mondays and Tuesdays, the town is much more crowded. “When the ships are in, there are more people on the cruise ships than there are residents on the island,” said Paula. She has lived off and on the 1.5-square-mile island for most of her life. Catalina is the second largest island of the Channel Islands chain and the only one that is inhabited. “The other islands are devoted to science or the military,” said Paula. Our next dining destination, C. C. Gallagher, is known for their creative menu items. Sitting at a corner table we indulged in sipping elevated ice cream floats. 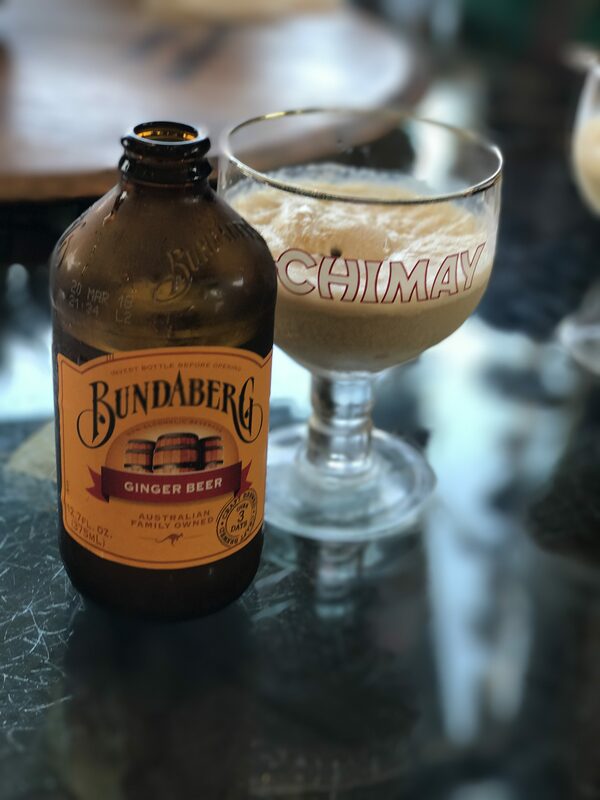 Instead of root beer, they poured Bundaberg Ginger Beer over a generous scoop of salted caramel ice cream and sprinkled chocolate and caramel buttons on top. C.C. Gallagher is an elegant gift shop and wine bar, too. It once was a Security Pacific National Bank and still has the bank vault inside. On the exterior of the corner building is the famous Descanso green Catalina tiles. 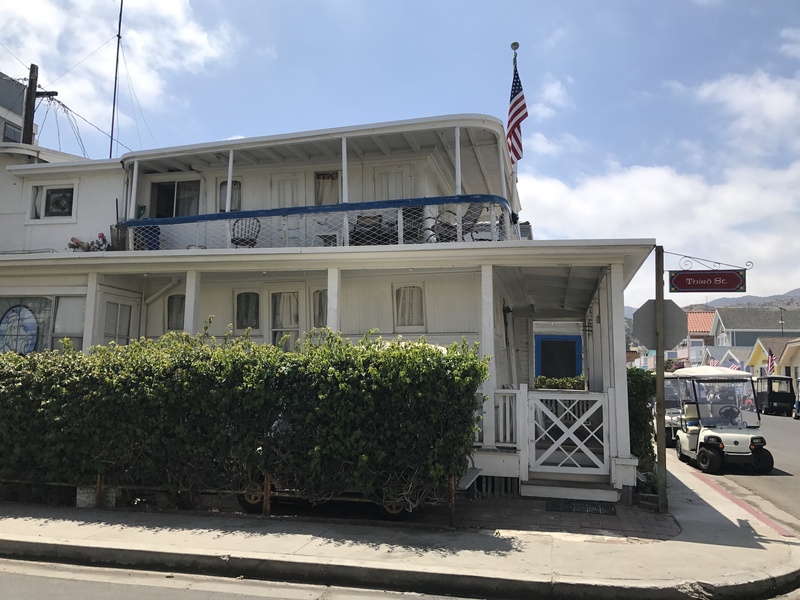 Paula shared the history of the island, from the Tongva native people to William Wrigley Jr. and his family. Walking up the street Paula pointed out a residence that is made from two recycled steamboats. It’s located on Third Street. 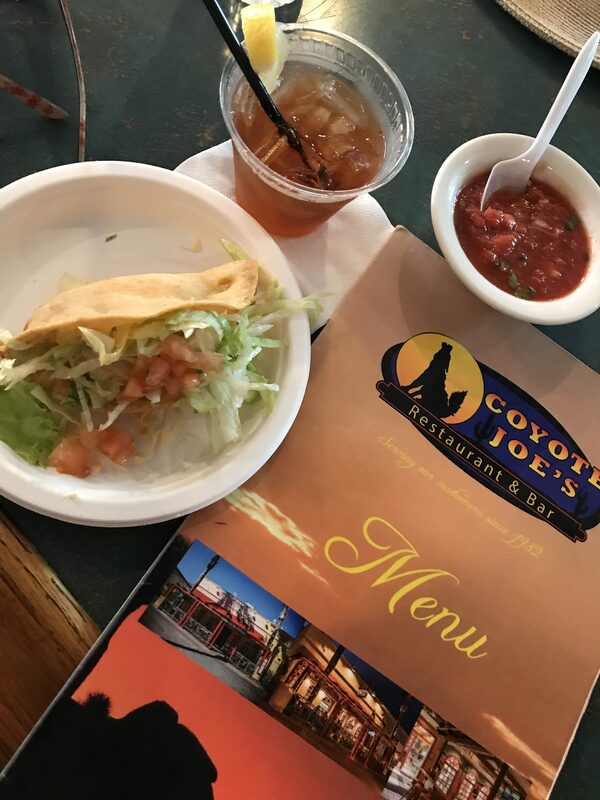 “Avalon doesn’t have a First or Second Street, just a Third Street,” she told us before we enjoyed our third tasting–at Coyote Joe’s, a locals hot spot for tacos, guacamole and margaritas that was established in 1982. The owners make a John Daly cocktail that is too easy to drink down. It’s made with sweet tea, lemonade and vodka. We enjoyed sipping one while biting into a delicious crispy potato taco. Strolling to our next destination, we noticed that most of the residents drive around town in a golf cart. Paula pointed to the oldest miniature golf course west of the Rockies as we walked to the Avalon Arcade. “This is the post office; every resident has a post office box inside. It’s the town’s local gathering spot,” Paula said. 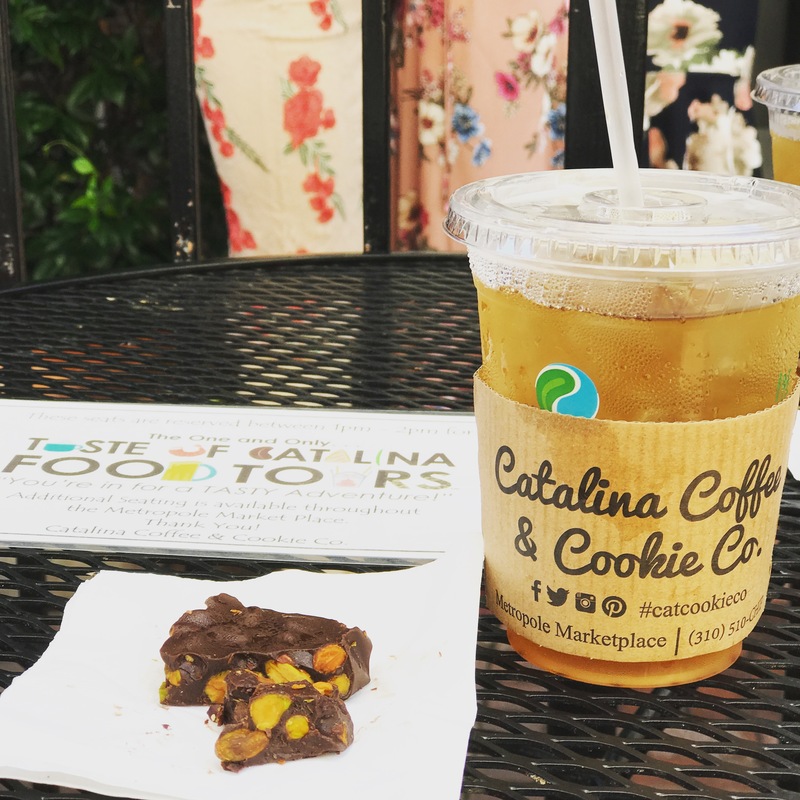 On the other side of the Arcade (no games, just a local hardware store, gift shop, a real estate office and a coffee cafe), we walked over to Catalina Coffee & Cookie Co. At this location we sipped Sweet & Spicy Good Earth Ice Tea and had a large piece of dark chocolate and nut candy. Afterwards we walked to the harbor view Bluewater Avalon seafood restaurant for an IPA beer, cup of clam chowder and plate with shrimp ceviche and crunchy tortilla chips. You would think with all this food we would be too full. However the portions were small and the flavors were different and appealing at each location. Our last restaurant, Maggie’s Blue Rose, is owned by Steve Bray’s wife Maggie. It’s a gourmet Mexican restaurant serving excellent margaritas. We were served Maggie’s Blue Rose margaritas in clear skull glasses that offered true island flavors with Casa Noble Reposado tequila, Cointreau, blue curaçao, Grand Marnier and sweet and sour. Plates arrived with a few pieces of achiote pepper skirt steak, a cole slaw made with apples, jicama and pickled onions and a savory chicken and cheese enchilada. Next time you would like to explore and learn more about Catalina Island, reserve a spot at www.CatalinaFoodTours.com.